Durable soft, PVC-free plastic is reusable and displays names clearly. Top-loading design with patented Avery® Garment Friendly™ clip that holds firmly without damaging fabric. Micro-perforated inserts separate cleanly leaving smooth edges. 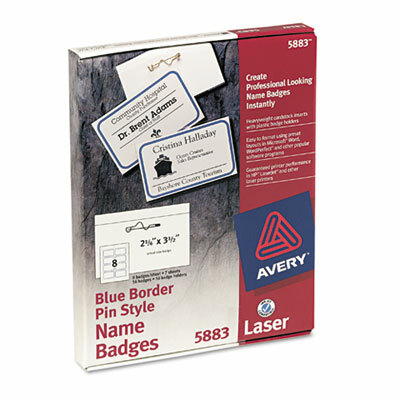 Create simple, fast, professional name badges with free Avery® templates and software. Kit includes clear plastic badge holders and micro-perforated 8 1/2 x 11 sheets of inserts.